Born in Warwickshire, England in 1854, she trained at Queen’s Hospital before joining the nursing sisters in the British army. She served in a series of imperial campaigns in locations that included South Africa during the Zulu War, Egypt, and the Sudan. 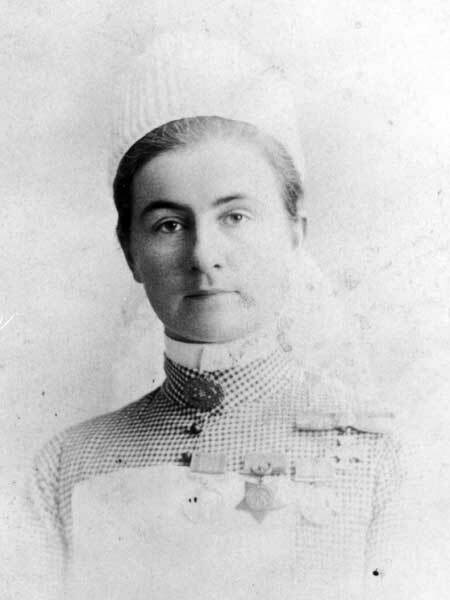 She was decorated in each of these campaigns, receiving the Royal Red Cross Medal in 1884. In that same year she moved to Auckland, New Zealand, to establish New Zealand’s first school of nursing, and in 1886 she married Dr. John Henry Richard Bond. She went to the United States with her husband, administering the British exhibit at the Chicago World’s Fair in 1893. The couple eventually settled in Winnipeg in 1903. She began urging the foundation of a children’s hospital in 1906, and in 1909 she began one on Beaconsfield Street which became the Winnipeg Children’s Hospital. She died there on 11 June 1943 as one of the few patients over the age of 14 ever admitted. A Vision Fulfilled: The Story of the Children’s Hospital of Winnipeg 1909-1973 by Harry Medovy (1979).